1- The Gaulish Coligny calendar was found in Coligny, Ain, France (46°23′N 5°21′E) near Lyon in 1897, along with the head of a bronze statue of a youthful male figure. It is a lunisolar calendar. It is now held at the Gallo-Roman Museum of Lyon. It was engraved on a bronze tablet, preserved in 73 fragments, that originally was 1.48 m wide and 0.9 m high. It is written in Latin inscriptional capitals, and is in the Gaulish language . The restored tablet contains sixteen vertical columns, with 62 months distributed over five years. 2- The Villards d’Heria is a similar calendar, found nearby at Villards d’Heria (46°25′N 5°44′E) is only preserved in eight small fragments. It is now preserved in the Musée d’Archéologie du Jura at Lons-le-Saunier. The Coligny Calendar is an attempt to reconcile both the cycles of the moon and sun, as is the modern Gregorian calendar. However, the Coligny calendar considers the phases of the moon to be important, and each month always begins with the same moon phase. The calendar uses a mathematical arrangement to keep a normal 12 month calendar in sync with the moon and keeps the whole system in sync by adding an intercalary month every 2½ years. The Coligny calendar registers a five-year cycle of 62 lunar months, divided into a “bright” and a “dark” fortnight (or half a moon cycle) each. The months were possibly taken to begin at full moon, and a 13th intercalary month was added every two and a half years to align the lunations with the solar year. 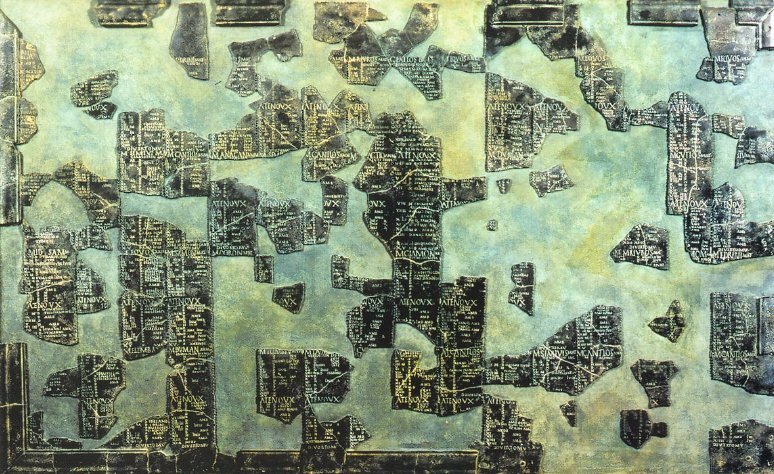 The astronomical format of the calendar year that the Coligny calendar represents may well be far older, as calendars are usually even more conservative than rites and cults. The date of its inception is unknown, but correspondences of Insular Celtic and Continental Celtic calendars suggest that some early form may date to Proto-Celtic times, roughly 800 B.C.E. The Coligny calendar achieves a complex synchronization of the solar and lunar months. Whether it does this for philosophical or practical reasons, it points to considerable degree of sophistication. The calendar year began with Samonios, which is usually assumed to correspond to Old Irish Samhain, giving an autumn start to the year. However, as Samon is Gaulish for summer (Lambert p. 112), this assumed start is disputed. Le Contel and Verdier (1997) argue for a summer solstice start of the year. Monard (1999) argues for an autumn equinox start. Bonsing (2007) argues for a May beginning consistent with Irish Beltaine, and Fennian literature, notably Joyce (2000). The months were divided into two halves, the beginning of the second half marked with the term atenoux or “renewal” (cf. Old Irish athnugud “renewal”). The basic unit of the Celtic calendar was thus the fortnight or half-month, as is also suggested in traces in Celtic folklore. The first half was always 15 days, the second half either 14 or 15 days on alternate months (similar to Hindu calendars). Months of 30 days were marked matus, lucky. Months of 29 days were marked anmatus, unlucky. The Lands End peninsula is home to one of the most extraordinary standing stones in Europe: the “Mên-an-Tol” (also Men an Toll), a small formation of standing stones near the Madron-Morvah road in Penwith, Cornwall, United Kingdom (grid reference SW426349). It is about 3 miles north west of Madron. It is also known locally as the “Crick Stone” (reputation for curing back problems), “Stone with the Hole”or ‘The Devil’s Eye’ . 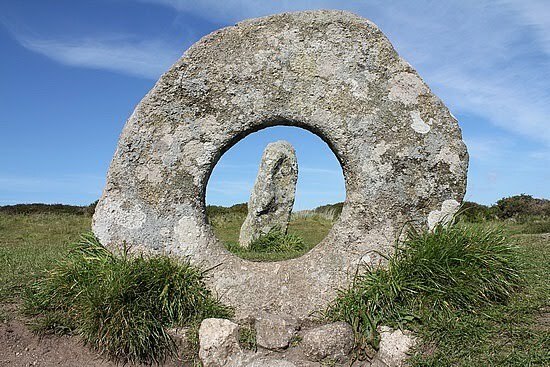 The name Mên-an-Tol is Cornish Language, literally meaning “the hole stone”. 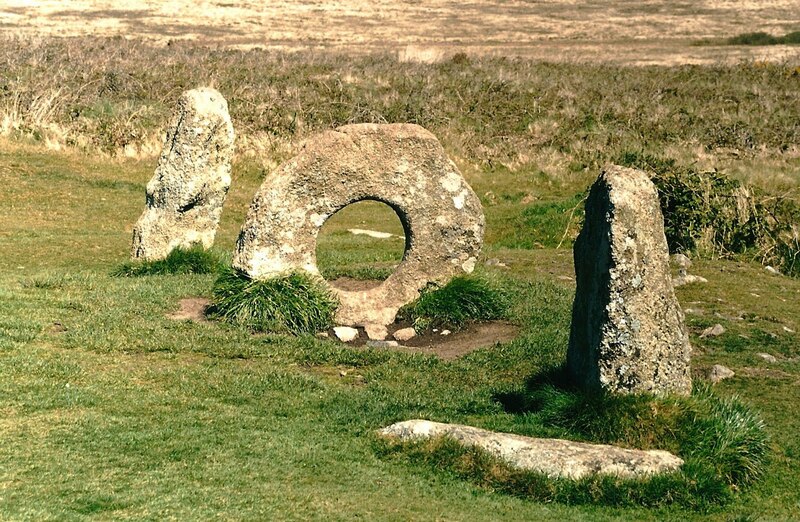 It consists of three upright granite stones: a round stone with its middle holed out with two small standing stones to each side, in front of and behind the hole. When seen at an angle from one side, the stones form a three-dimensional “101” (see picture). The Men-an-Tol is undoubtedly one of the more famous yet least understood of Cornish ancient monuments, for the original arrangement of this mysterious grouping of stones is unknown, having almost certainly been re-arranged in the distant past. It is thought by many that the stones were originally part of either a lost tomb or stone circle that once occupied the site. Antiquarian representations of the site differ in significant details and it is possible that the elements of the site have been rearranged on several occasions. William Borlase described the monument in the 18th Century as having a triangular layout, and it has been suggested that the holed stone was moved from its earlier position to stand in a direct alignment between the two standing stones. In the mid 19th Century, a local antiquarian JT Blight proposed that the site was in fact the remains of a stone circle. This idea was given additional support when a recent site survey identified a number of recumbent stones lying just beneath the modern turf which were arranged along the circumference of a circle 18 metres in diameter. The recumbent stones are somewhat irregularly spaced but the three extant upright stones have smooth inward facing surfaces and are of a similar height to other stone circles in Penwith. Mên-an-Tol is supposed to have a fairy or piskie guardian who can make miraculous cures. In one case a Changeling baby was put through the stone in order for the mother to get the real child back. Evil piskies had changed her child and the ancient stones were able to reverse their evil spell. Local legend claims that if at full moon a woman passes through the holed stone seven times backwards, she will soon become pregnant. Another legend is that passage through the stone will cure a child of rickets (osteomalacia). For centuries, children with rickets were passed naked through the hole in the middle stone nine times. Its curative powers actually are reflected in its name. It was also said to provide an alternative cure “scrofulous taint”, also known as the “Kings Evil” which was otherwise only curable by the touch of the reigning monarch. One can only wonder how many people have passed trough this iconic granite portal over the centuries. Divinations were made by the use of brass pins placed upon the central stone. Their movement would indicate the answers to queries put to the spirit of the stone. Local Witches and magical folk make use of the portal to birth charms and spirit items. The circular stone aligns exactly with the centre stone at Boscawen-Un and the church at nearby St Buryan. While this may conceivably be coincidental, the precision of the alignment suggests an intentional positioning of the structures in relation to each other. 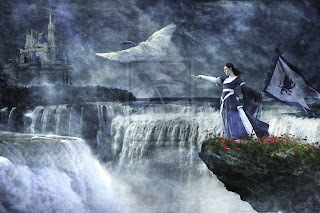 King Arthur:"The Avalon’s Enigma" – Does the Avalon’s conception is actually celtic? 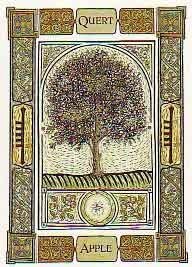 Does the Avalon’s conception is actually celtic? As I quoted on previous posts , Avalon is referenced by Geoffrey of Monmouth in the Historia and much subsequent literature which he inspired, as the place where King Arthur is taken after fighting Mordred at the Battle of Camlann to recover from his wounds. Welsh, Cornish and Breton tradition claimed that Arthur had never really died, but would inexorably return to lead his people against their enemies. The Historia also states that Avalon is where his sword Caliburn (Excalibur) was forged. 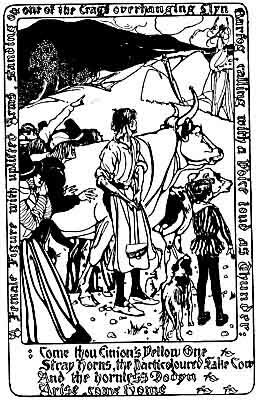 The island of apples which men call “The Fortunate Isle” (Insula Pomorum quae Fortunata uocatur) gets its name from the fact that it produces all things of itself; the fields there have no need of the ploughs of the farmers and all cultivation is lacking except what nature provides. Of its own accord it produces grain and grapes, and apple trees grow in its woods from the close-clipped grass. The ground of its own accord produces everything instead of merely grass, and people live there a hundred years or more. There nine sisters rule by a pleasing set of laws those who come to them from our country. What is now known as Glastonbury was, in ancient times, called the Isle of Avalon. It is virtually an island, for it is completely surrounded by marshlands. In Welsh it is called Ynys Afallach, which means the Island of Apples and this fruit once grew in great abundance. After the Battle of Camlann, a noblewoman called Morgan, later the ruler and patroness of these parts as well as being a close blood-relation of King Arthur, carried him off to the island, now known as Glastonbury, so that his wounds could be cared for. Years ago the district had also been called Ynys Gutrin in Welsh, that is the Island of Glass, and from these words the invading Saxons later coined the place-name ‘Glastingebury’. Though no longer an island in the twelfth century, the high conical bulk of Glastonbury Tor had been surrounded by marsh before the surrounding fenland in the Somerset Levels was drained. In ancient times, Ponter’s Ball Dyke would have guarded the only entrance to the island. The Romans eventually built another road to the island. As Gerald says, Glastonbury’s earliest name in Welsh was Ineswitrin (or Ynys Witrin), the Isle of glass, a name noted by earlier historians which shows that the location was at one point seen as an island. The discovery of the burial is described by chroniclers, notably Gerald of Wales, as being just after King Henry II‘s reign when the new abbot of Glastonbury, Henry de Sully, commissioned a search of the abbey grounds. At a depth of 5 m (16 feet) the monks discovered a massive treetrunk coffin and a leaden cross bearing the inscription: Hic jacet sepultus inclitus rex Arthurus in insula Avalonia. (“Here lies renowned King Arthur in the island of Avalon”). Accounts of the exact inscription vary, with five different versions existing. The earliest is by Gerald in “Liber de Principis instructione” c.1193, and he says he saw the cross, and it read: “Here lies buried the famous King Arthur with Guinevere his second wife in the isle of Avalon”. Inside the coffin were two bodies, who Giraldus refers to as Arthur and “his queen“; the bones of the male body were described as being gigantic. The account of the burial by the chronicle of Margam Abbey says three bodies were found, the other being of Mordred. In 1278, the remains were reburied with great ceremony, attended by King Edward I and his queen, before the High Altar at Glastonbury Abbey, where they were the focus of pilgrimages until the Reformation. The burial discovery ensured that in later romances, histories based on them and in the popular imagination Glastonbury became increasingly identified with Avalon, an identification that continues strongly today. 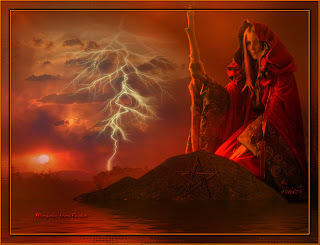 The later development of the legends of the Holy Grail and Joseph of Arimathea by Robert de Boron interconnected these legends with Glastonbury and with Avalon an identification which also seems to be made in Perlesvaus. The popularity of Arthurian Romance has meant this area of the Somerset Levels has today become popularly described as The Vale Of Avalon. In more recent times writers such as Dion Fortune, John Michell, Nicholas Mann and Geoffrey Ashe have formed theories based on perceived connections between Glastonbury and Celtic legends of the otherworld and Annwn in attempts to link the location firmly with Avalon, drawing on the various legends based on Glastonbury Tor as well as drawing on ideas like Earth mysteries, Ley lines and even the myth of Atlantis. Arthurian literature also continues to use Glastonbury as an important location as in The Mists of Avalon and A Glastonbury Romance. Even the fact Somerset has many apple orchards has been drawn in to support the connection. Glastonbury’s connection to Avalon continues to make it a site of tourism and the area has great religious significance for Neopagans Neo-druids and as a New Age community as well as Christians. Hippy identification of Glastonbury with Avalon seen in the work of Michell and in Gandalf’s Garden also helped inspire the Glastonbury Festival. In medieval times suggestions for the location of Avalon ranged far beyond Glastonbury. They included on the other side of the Earth at the antipodes, Sicily and other unnamed locations in the Mediterranean. In more recent times, just like in the quest for Arthur’s mythical capital Camelot, a large number of locations have been put forward as being the real ‘Avalon’. These theories include l’Île d’Aval or Daval on the coast of Brittany and Burgh by Sands in Cumberland, which was in Roman times the fort of Aballava on Hadrian’s Wall near Camboglanna. According to Welsh tradition (as first recorded in the 10th century Annales Cambriae), Arthur was killed in battle at a site named Camlann which may be derived from either a Brittonic *Cambo-glanna “Crooked bank (of a river)” (compare the name of the Roman fort of Camboglanna) or *Cambo-landa “Crooked-enclosure”. Geoffrey Ashe suggests an association of Avalon with the town of Avallon in Burgundy, as part of a theory connecting King Arthur to the Romano-British leader Riothamus who campaigned in that area. There are some texts, though, that do attempt to locate the Isle of Avalon into a particular region of Britain. The Isle of Man, for example, has been presented as Avalon, as well as Bardsey Island in northern Wales as discussed on a previous post, it is located in Gwynedd, famous for its apples and also connected with Merlin and St Michael’s Mount in Cornwall, near to other locations associated with the Arthurian legends have also been suggested. St Michael’s Mount is an island which can be reached by a causeway at low tide.